I read the first two books of Jemisin’s Inheritance series a few years ago – I liked them okay but I wasn’t blown away, so I was in no hurry to read more of her work. However, when I received The Killing Moon for a recent LibraryThing Christmas swap I participated in, I remembered that I had a review copy of The Fifth Season on my shelf, and it also won the Hugo this year, so I figured I should read it. I’m glad I did, because it’s fantastic! The Fifth Season is set on a world where people are used to dealing with apocalypses, they happen every couple of centuries. A new cataclysm has just started though, and this one may not be survivable despite the widespread disaster preparation. We follow three viewpoints – Essun, Damaya, and Syenite, and it’s not immediately clear how they are all connected, or even if they take place at the same time. I thought of Essun’s viewpoint as the main one though, since it’s clearly taking place after the cataclysm. Essun is an orogene (born with the feared earth magic), whose husband has just murdered her young son for possessing magic and taken off with her daughter in tow. As she tracks him, we see the world starting to fall apart around her. I loved this book. The characters are fantastic – Essun’s grief is raw and visceral and scary, and it’s rare that I’ve seen those depths explored in fantasy, the only comparison I can think of is Robin Hobb. Damaya and Syenite also leap off the page, and when you finally find out how the three viewpoint characters are connected, it packs a huge emotional punch. That doesn’t even count the secondary characters, who are three-dimensional and haunting. I keep using the word fantastic, but I’m not sure how else I can describe this book! 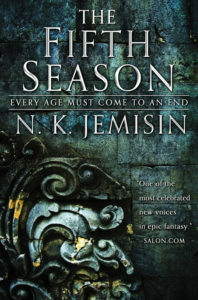 The world is unique and completely immersive, Jemisin has thought through every little detail of how a society that has to deal with apocalypses frequently would do things. It is a harsh world with harsh people, but there’s also kindness when it can be afforded. And there is a good explanation (or the beginning of one) for why the world ended up the way it is – the Stillness is not a world without science. I kept hearing The Fifth Season described as both apocalyptic and magical, and I wasn’t sure exactly how those two separate genres would work together. Everything just falls into place, though! Highly recommended, and I can’t wait to read The Obelisk Gate. This entry was posted in Books, Reviews and tagged fantasy, fiction by Kriti Godey. Bookmark the permalink.